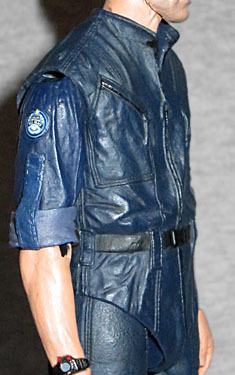 Series 3 of NECA's Aliens figures actually covered the first three films in the series - the only real Aliens figure was Bishop. A Hyperdine android... sorry, "artificial person" is his preferred term, designed to study alien creatures, Bishop was assembled on LX-469. In keeping with Weyland-Yutani and USCM regulations, he was assigned to the Sulaco as an executive officer, primarily responsible for planetary manuevering. In 2179, the unit was deployed to LV-426 to investigate the sudden loss of contact with the colony of Hadley's Hope, and though he did not engage in combat, he acted as a medic and support staff. Bishop was more personable and friendly than Ash, the android in the first movie (and about 100% less evilly homicidal). Clearly this was done to make him more relatable to the human members of the crew, but remember, it is totally possible to make a synthetic assistant who's friendly and helpful, but still hated by everyone they meet - or have you forgotten Microsoft's Clippy? Bishop was played by Lance Henriksen, one of only two actors (along with Bill Paxton) to have been killed by an Alien, a Predator, and a Terminator. The sculpt is excellent, of course, but the quality of the likeness really depends on the paint. Unfortunately, this series seems particularly rare, so good luck being able to compare quality before you buy. Since he's not a combat droid, Bishop doesn't get the fancy armor the Colonial Marines wore - instead, he's just sporting a blue jumpsuit, which makes him look like a skinnier Michael Myers. There are angled pockets on the chest, loops for the plastic-clasp belt to go through, another set of pockets on his thighs, and two more on the seat of his pants. The ones in the back are covered by flaps, while the four on the front have zipper with (sculpted) nylon ties on the pulls. Oh, there are also zipper pockets on the lower legs. His sleeves are rolled up and he has the Suluaco patch on his right shoulder that identifies the unit as the "2nd Battalion, 9th Regiment." No doubt it's incredibly screen-accurate, but it does feature NECA's new favorite trick, a rubber shell over the body beneath. It's fine when it's just a shirt or just shorts, or even when it's a combination of the two, but one single piece from neck to nuts is not a good choice. It's seamless, but it doesn't really allow the figure move as well as it normally would. Does Bishop have a chest joint or a waist? According to people who have disassembled the toy, "yes, both, and they're balljoints," but we can't say for sure. Plus, his right shoulder refuses to go all the way into its socket, and the left leg keeps falling off at the thigh. I might have chosen to get a replacement Bishop, but again, this series is super hard to find, so that's a non-starter. One bit that isn't screen-accurate? His shoes. They're so very close, but not quite perfect. In the film, Bishop wore futuristic Reeboks, just like Ripley did (hers were hightops, but his were just mids). In reality, they were modified BB 6600s, with velcro in place of laces and a ribbed tongue, hand-made by Reebok for the film. 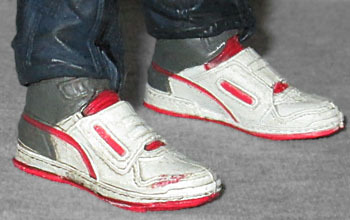 And while the shoes on this toy don't say "Reebok" on them, the design is close enough that NECA must have had to license the designs just like they do an actor's face. 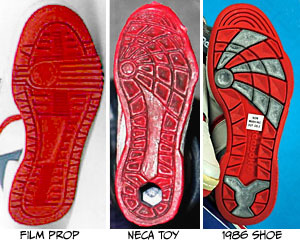 However, that's what causes the problem: in 1986, Reebok offered a mass market version of the shoe (originally dubbed the "Aliens Fighter Shoe," but the nickname "Alien Stompers" has since been officially adopted); presumably that's what NECA was working from, because the soles of the shoes on this toy are clearly based on the commercially available sneakers, not the film props; however, they're solid red, like in the movie, not red and grey like the mass release. 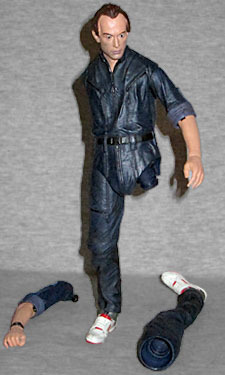 In short, to a dedicated sneakerhead, this toy is going to look like Bishop is cosplaying as himself. 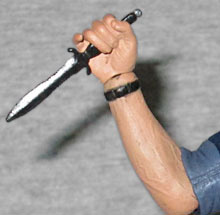 Bishop's accessories include his flashlight (a normal, off-the-shelf model modified so the front and side lamps could be on at the same time), his knife, and a second, knife-holding hand, because the normal hand is wide open so it can grip the flashlight. The light is really impressive: it's painted yellow at the tip, simulating the color of that bulb's light, while the clear plastic cover over the side lamp pops off. It might have been neat if they gave the bulbs some glow-in-the-dark paint apps, but that's just us dreaming after the fact. The two panels on the back are both painted orange, rather than having one orange and one red, like the real version, but they've even sculpted the control dial. Nice! We do have to admit that the knife points out an unfortunate omission. If he's got the knife, why hasn't he also got an alternate left hand with the fingers splayed? How can he play his knife game if he doesn't spread his fingers? Better yet, give him two hands: one for him, and one for Hudson. No, Hudson isn't wearing his armor in the cafeteria, but who really cares about that? It would be fun! But maybe too expensive. Although again, having the dude in the blue jumpsuit stand around holding a knife just brings back those Michael Myers comparisons. Bishop is an okay figure by NECA standards, but there are just some things that could make him better. Including the ability to easily walk into a store and buy him.